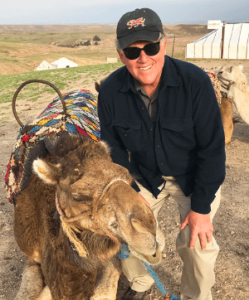 Casablanca, snake charmers in Marrakesh, the Atlas Mountains, Volubilis Roman city, the souk in Fez, Berber rugs, and – yes – riding a camel. All part of a fascinating trek across Morocco. Closing with dinner at Rick’s Café. Morocco is a fascinating country. Your guide will speak of the 12th century with the same familiarity that we speak of the ‘60s. As a Muslim country, buying alcohol is difficult. But vineyards are a growth industry, and Casablanca Beer and Sahari Reserve were my beer and wine of choice. I could describe my hour and a half ride on camel #2 and what I observed about the aft quarters of camel #1. But I will share other observations. Every time I charter a sailboat in the Caribbean, I wonder what business would include more time in those sunny, warm waters. My answer for Morocco is peanut butter and orange juice. Every breakfast includes wonderful breads – different kinds of breads – with jams and honey. But no peanut butter. I had the best orange juice ever – freshly squeezed – but you cannot buy “orange juice” – just oranges. OK – who is in for meeting this unmet consumer demand? Lots of oranges for making orange juice. May have to grow peanuts, but lots of nuts are grown in Morocco. Did I mention that Morocco is the world’s 6th largest producer of olives but does not make tapenade? Morocco produces raw materials but is not a processor. While you are considering these opportunities, let’s go back to the 12th century. When we go into a car dealer, we know there will be distasteful haggling about the price of the car. But in the US consumer-facing economy, the price you pay is the mostly the posted price. In Morocco, every purchase is negotiated – from the taxi ride, to the porcelain platter, to the $1 magnet for your refrigerator. Try going into CVS and bargaining over the price of hairspray. The 12th-century culture of settling every transaction by a person-to-person bargain co-exists – at least for the moment – with our online visible to everyone mass production, mass distribution, and mass consumption 21st century. The many Moroccans I met and worked with could not have been more open and generous. Their society is in transition – migration from farms to the city, larger participation of women in society, upscaling agriculture, engagement with the world economy and tourism, and investment in roads and infrastructure. Morocco is proud of its historic role as a center of learning in the Arab world. I am grateful for my experiences, and my best wishes are with these terrific people. My last night in Morocco was at Rick’s Café in Casablanca. While Sam was not there, the piano player gave us As Time Goes By. Kathy Kriger founded Rick’s Café. She told me her story that night at the bar. Kathy was stationed at the US embassy in Morocco during 9/11. She was close to retirement and thinking about what to do next. There was no Rick’s Café in Casablanca. Would a higher end restaurant and bar based on a beloved but older US movie succeed in a Muslim country? Kathy bought a grand mansion in the port district and re-created Rick’s Café. She stuck her neck out and succeeded. If Kathy Kriger from Portland, OR, can successfully create one of the only two reasons for a tourist going to Casablanca – the Hassan II Mosque is the other – we can make a peanut butter and orange juice business succeed.